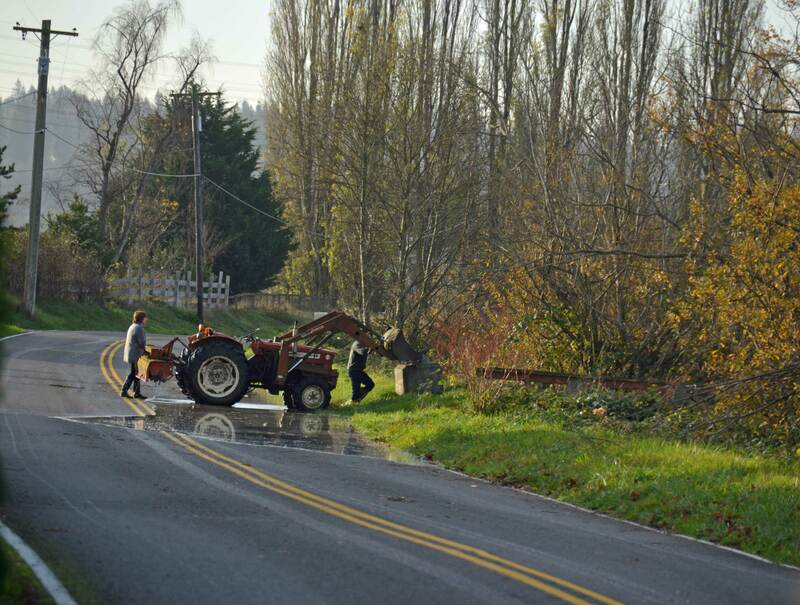 In the Pacific Northwest, fall brings windstorms and rain, sometimes in torrents. If the jet stream from Asia lines up just right and picks up moisture from typhoons or other sources, an “atmospheric river” forms; meterologists describe it as a “firehose” when the mountains stall the front and rain dumps continuously. We’ve experienced two of these, one with a serious windstorm. Since resulting flooding occurred back-to-back, I’ll call it “round one”. We survived round one despite crumbling dikes that bulged in seams indicating seeping from the river to the backslope. We survived the windstorm, too, with a short power outage and a few trees affected by 60-mph windgusts that came from an different direction than usual. I found front porch railings popped and discovered at morning light that the 30 foot tall Alaska weeping cedar had begun to tip over onto a porch post, leaving a rut where the roots were lifting out of the ground on one side. I will definitely be doing some work to help that tree build new roots and to beef up any barrier to keep it from tipping onto the house! 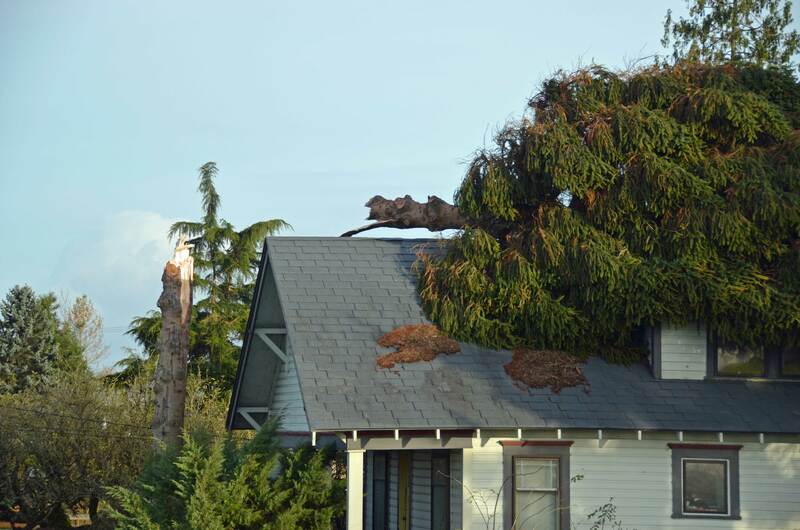 Windgusts of 60 mph (95 km/h) from an unusual direction snapped this tree and tipped the top onto a neighbor’s roof. I usually evacuate before large floods, but with a horse suffering from deteriorating ligaments, a walk up the hill or trailer ride could exacerbate the problem, and will only happen if needed. My reaction to these events is tempered by the sober realization that we all signed up for this. It’s not just that I moved to this place. It’s that we altered this place to make it more hazardous during weather events. We logged upstream and put in buildings and roads that shed more water into the rivers during storms. Tree canopies no longer slow the procession of rain to ground. We channelized the river, making it run faster and higher during floods. 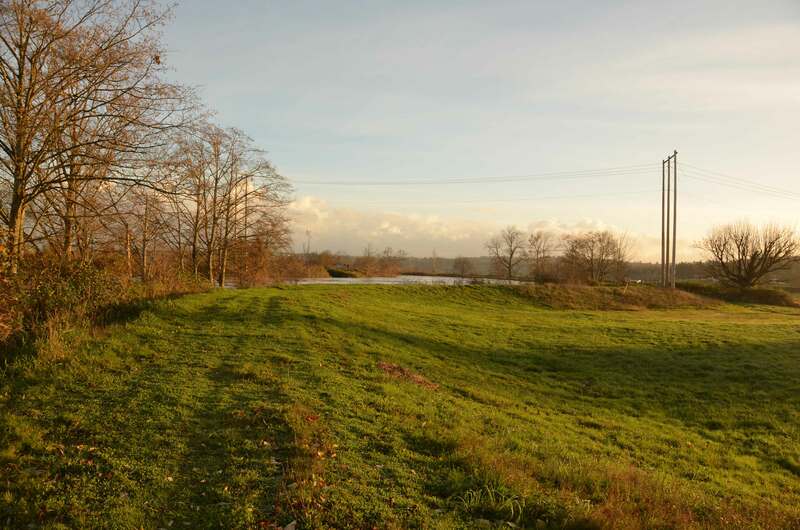 We build “farmer engineered mountains of mud”: dikes that don’t conform to Army Corps standards, much less aspire to be the complex flood control of the Netherlands. 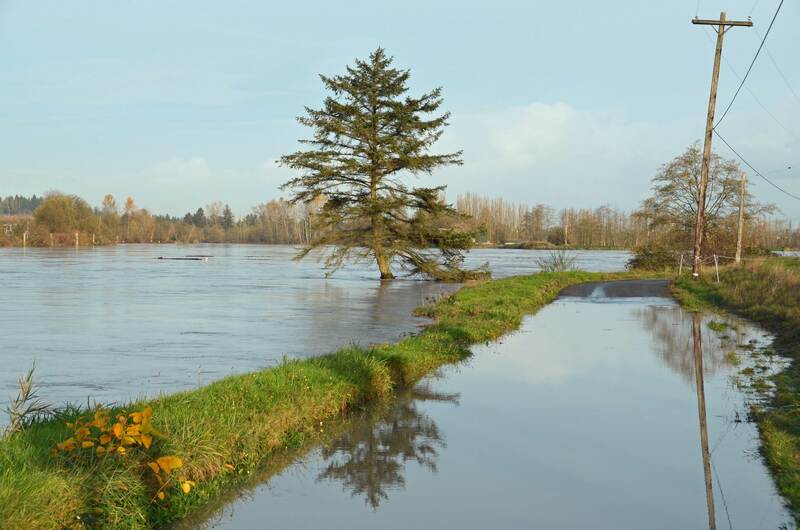 This was the dream of Dr. Henry Smith when he first saw the Snohomish River system: a new Holland. We are no Holland, but instead a patchwork of both sturdy and crumbling dikes holding water back from homes and hundreds of millions of dollars worth of infrastructure: jet fuel conveyance pipelines, massive water mains, high voltage power lines, communications cables sharing pole space with local utilities, commuter roads, and bridges. We are a train wreck waiting to happen, a New Orleans or New Jersey waiting for the Big One. And that other Big One- a massive earthquake expected at some time in our region- could liquefy our jello-esque dikes and send a tsunami 9 miles upstream. So why do people live in places like this? People live with natural hazards throughout our region because of the beauty, the diversity of activities, jobs, and the economy. It’s a case of picking your poison: windstorms, ice storms, earthquakes, tsunamis, landslides, volcanoes, coastal and river flooding, even drought. Tornadoes and severe thunderstorms are rare events that pale in comparison to the intermittent massive weather and geological events that can whack us all. People are flocking to this region: my county is expected to absorb 200,000 more people in the next 20 years. We will have to be a lot more proactive, get a lot more clever, and spend a lot more money to make this immigration wave work in an area that wants to blow up or just crumble into the sea. For those of us who are already here, we’ll have to keep whistling past the graveyard and hoping for the best.